This Greek island is special. Sure, like the others it’s full of history, myths, unbelievably beautiful sceneries, but its majestic forts, romantic trails, lush vegetation, and sapphire sea leave no room for doubt. Corfu, the Jewel of the Ionian Islands, offers an ideal setting for a vacation home in a haven of peace and beauty. Buying a vacation home on the island of Corfu is like finding a diamond in the rough. As the story goes, the island of Corfu was discovered by a shipwrecked Odysseus. True or not, this rugged piece of land floating in the Ionian Sea is full of both mythical and historical traces. In fact, the old town of Corfu was enlisted to the UNESCO World Heritage List in 2007. The old town of Corfu, which also goes by the name Campiello, is full of mystery and charm. Its narrow streets are embellished with stately buildings and aristocratic mansions with a neoclassical flair, as other alleyways are lined with balconies and clothing lines swaying in the breeze. On the other hand, 5-star treatment is offered at the island’s many ultra-luxe hotels. Together, the atmosphere is unreal – romantic, adventurous, modest, and luxurious all at once. 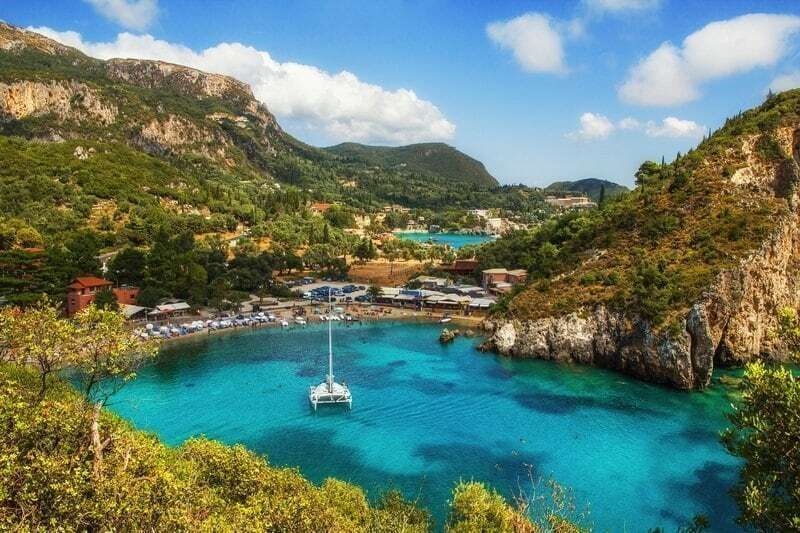 This is the irresistible charm of Corfu, and it’s exactly what has attracted tourists, investors, and buyers in search of their dream vacation home, usually in a quiet setting outside of the urban centers. The property market in Corfu offers private villas in the hills with sea views on garden plots with aromatic olive, orange, and lemon groves; waterfront properties just steps away from the sea; and beautiful residences with swimming pools and airy outdoor spaces. Whatever the choice, the entire family will be marking their arrival to Corfu International Airport on their calendars 365 days in advance. To buy a luxury property on Corfu is to surround yourself with mythical heritage and legends of luxury in the heart of nature. The island of Corfu is unique in many ways, one of which is its diverse cultural influences. You’ll notice that its historical architecture has maintained a Venetian touch, from 3 centuries of reign. A visit to the old Venetian fortress on a rocky peninsula is essential for its incredible panoramic views. Other structures have a European sensibility, as a result of the French and British presence in the past. Lovers of aesthetics will be inspired by the Achilleion Palace, an exquisite 19th-century villa built in the village of Gastouri for an Austrian Empress with an obsession for beautiful things. Exploring the island’s places of worship is also a must. There are 37 churches in the old town alone. Our favorites are the Our Lady of the Cave and Saint Spyridon cathedrals for their bewildering beauty. An afternoon at the famed Liston, a stylish Venetian square, in the heart of Corfu the city. If its four-story arcaded houses look familiar, that’s because they were inspired by the Rue de Rivoli in Paris. But on this Greek island, it’s the go-to spot to unwind at a pleasant cafe or bistro and see who else is enjoying themselves on holiday. Corfu is the second largest island in the Ionian Sea, with a coastline that stretches 217 km. This means that the beaches are as beautiful as they are endless. Each brings its own special something: the bay of Paleokastritsa is the site of an ancient monastery; Benitses is a traditional fishing village and seaside resort with insurmountable charm; as Dasia and Ipsos, perhaps the most popular, are rushed by water sports enthusiasts. There is never a dry moment on the island of Corfu, you can count on that. Full of hidden gems, BARNES Greece would like to assist your treasure hunt to find the perfect vacation home on the island of Corfu.